What an exciting an challenging project this was! The Faena House project called for over 7,800 linear ft of Glacier White Corian® to be used as handrail caps on 14 floors of balconies on the 17 floor luxury tower. To create the futuristic look the architect was going for required that we thermoform the Corian® material. This made the nice round profile, but to then fit around the curved balcony layout, the handrail had to then be formed again. To produce this complex, double-formed shape, we actually designed and built our own custom machine. Solid Surface material, such as the DuPont™ Corian® used on this project, is a great choice for outdoor use. This material is highly versatile and holds up well under the elements from snowy New England to sunny Miami beach. We are so excited to be a preferred Dupont partner in their Powered by Corian® portfolio with our SterlingShapes line of formed sinks and bowls! The Powered by Corian® portfolio is made up of a select collection of products and systems made exclusively from Dupont™ Corian® solid surface. Found here are some of the industry’s most innovative and dynamic design partners. Choosing from among this elite portfolio guarantees the high performance and quality you would expect from a product recommended by Dupont™ Corian®. SterlingShapes is our line of attractively designed, custom-formed solid surface bowls, available in a wide variety of shapes and in almost every Corian® color. 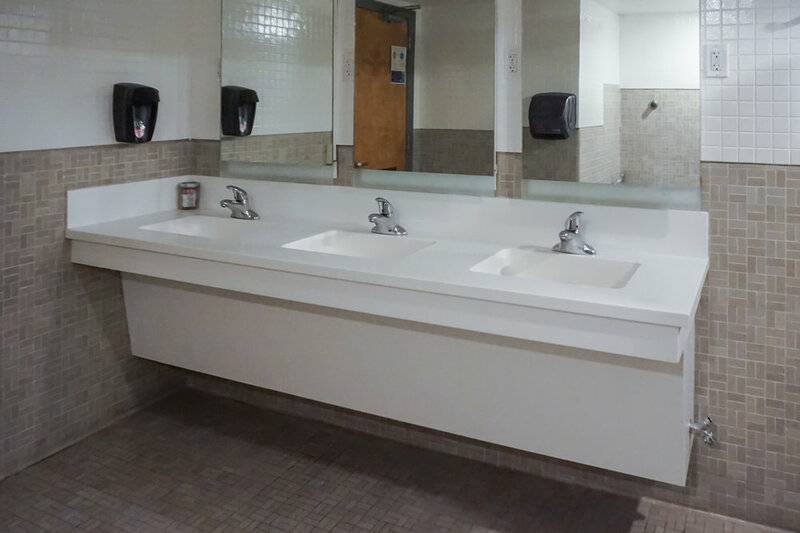 They are specifically designed for seamless, or simple under-mount fabrication into Corian® washroom counters, delivering the highest levels of aesthetic and functional performance. We invite you to learn more about our SterlingShapes products in the Powered by Corian® portfolio, or on the SterlingShapes page on our website. DuPont™ has recently launched a new advertising campaign, “That's Progress", to help refresh perceptions of the company and to convey a more purposeful, forward-looking image. As part of this campaign, DuPont™ has just released a new Corian® commercial that will soon air nationally in North America. This 60 second commercial highlights the benefits of Corian® in healthcare applications. 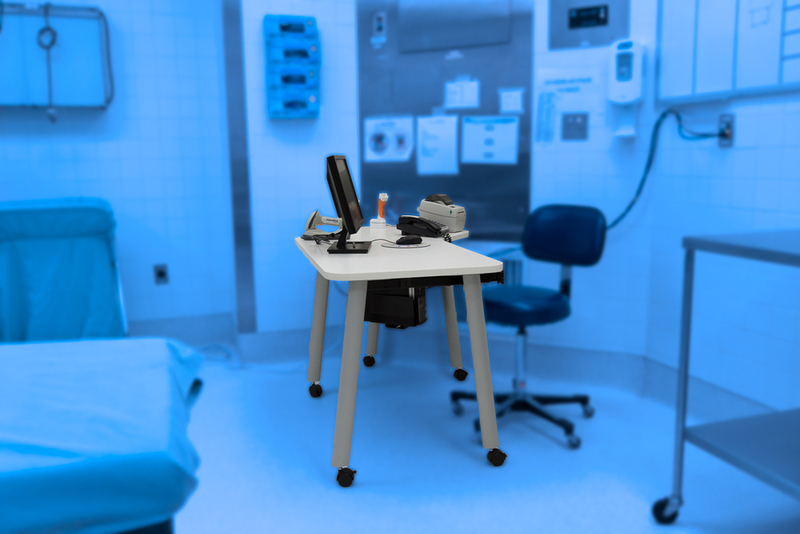 Not only does it protect from the spread of infectious disease, Solid Surface materials can also help cheer up patients with its soothing qualities of color and translucency. This is the first of a two-part series promoting Corian®. Later this year Dupont™ plans to release a two minute mini-documentary that will air globally on the series, BBC Horizons. "What happened to the big, heavy red armchairs that used to be in the food court in Grand Central Terminal? I thought they were cool." This was a reader question submitted to the F.Y.I. column in the New York Times' Metropolitan section. As the fabricator of this iconic project, we were curious to hear the answer to that question too. Shortly after it's renovation in 1998, 20 chairs and 4 love seats fabricated in our shop using thermoformed sheets of Corian® were installed in the Grand Central lower level dining concourse. The design, by David Rockwell, mimicked the plush, luxury wing- back chairs found on the 20th century Pullman coaches serving the terminal. The purpose was to attract visitors to try them out and also hopefully stop for lunch in the new food court area. The chairs were removed from the dining concourse in 2011 to ease congestion. They are now located in Grand Central's employee quarters and lounges. In the article, Mr. Brucker also shared an interesting tidbit regarding the inlayed design on the back of the chairs. "When the chairs left, they took with them a century-old secret reference to Cornelius Vanderbilt, the tycoon who owned the New York Central Railroad and who built the original Grand Central depot on 42nd Street in 1871. On the seat backs were huge replicas of the interconnected GCT letters, forming a trademark of the terminal. The symbol was produced so exactly that the "T" was correctly formed with sharp hook-like ends to the top cross members of the "T", and with the bottom of the "T" boasting a large round eyelet. When turned upside-down, the "T" formed an anchor, a symbol of Commodore Vanderbilt's origins. He amassed his first fortune in the shipping business before turning to railroads. These symbols still exist in the terminal, carved in marble and formed in elaborate iron works, but they're much more difficult to see than those chairs, and a lot less comfortable to sit on." 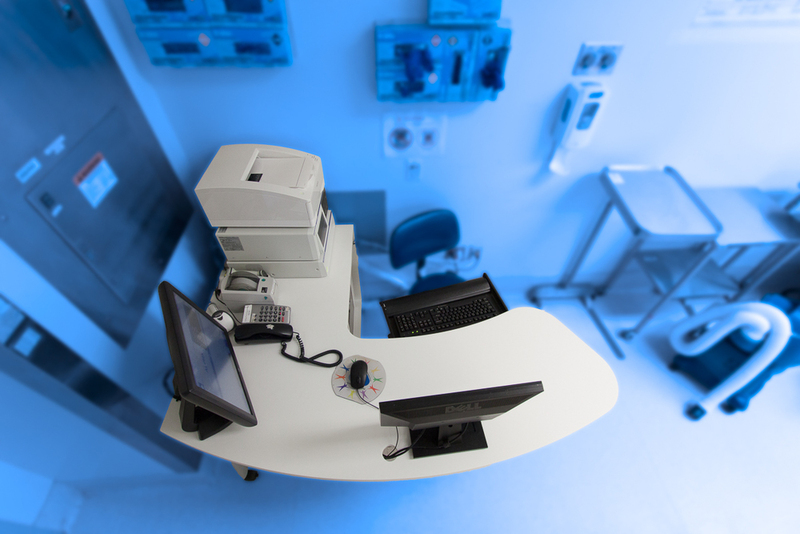 Because of it’s nonporous and infection control qualities, Dupont™ Corian® and other Solid Surface products have become trusted materials for doctors as well as architects designing for the healthcare industry. Our recent project for Hartford Hospital’s women’s patient center, required the fabrication of 39 custom baby care counters. The components have integral guards for the baby’s safety during bathing & checkup. The slanted deck allows bath water to drain into the basin. 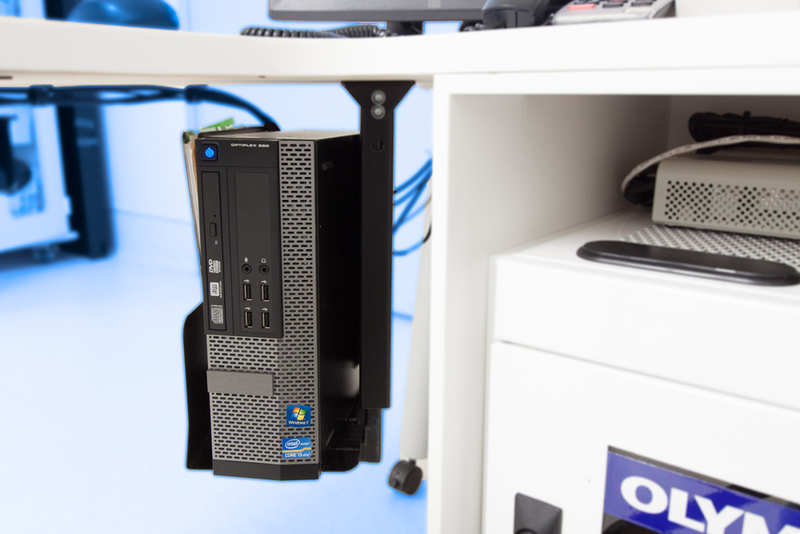 All joints are coved, making the units easy to clean and eliminates any areas for germs to hide. 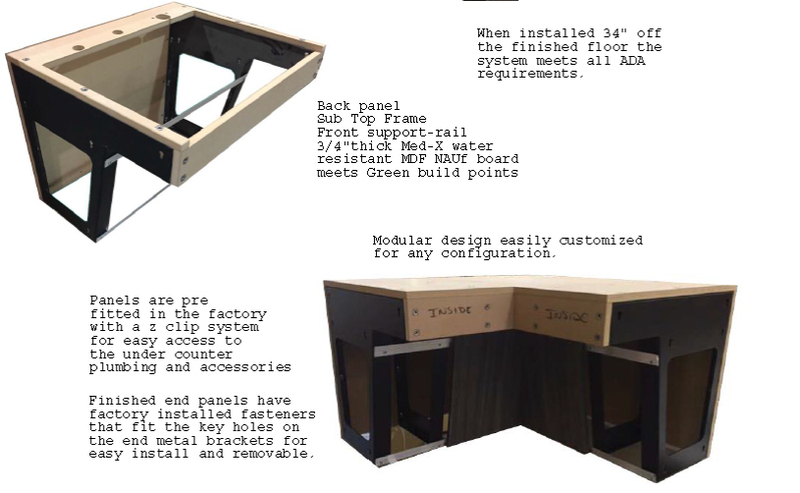 The use of 3D design software, 3D CNC machining, and of course the hard work of our experienced craftsmen, helped to make this practical design a reality. Mechanics Hall in Worcester, MA is a local landmark. This historic building is regularly used for meetings and events all year round from high school proms to rock concerts and symphony orchestras. The architect firm Lamoureax and Pagano in Worcester, MA was tasked to create the new decor in 4 very dated bathrooms. From the start, there was no doubt Mystera Solid Surface would be used with its grainy, stone-like patterns. The original design entertained using it throughout, utilizing Sterling Surfaces Redi-Stall system for the toilet compartments, and also having it used as wall paneling. Ultimately, the project budget allowed for its use in only two areas, the vanity countertops as well as the vanity cabinets and tables. For the cabinet material they chose from the Formica Solid Surface "Artifacts" line, which mimics fine burl wood grain aesthetics and rich wood tones, enhanced by a high-gloss finish. Sterling Surfaces has perfected the Solid Surface door used on European style frameless cabinetry. These are featured in this project in the form of recessed panel doors. The Solid Surface vanity tables are structurally reinforced with an internal steel frame. 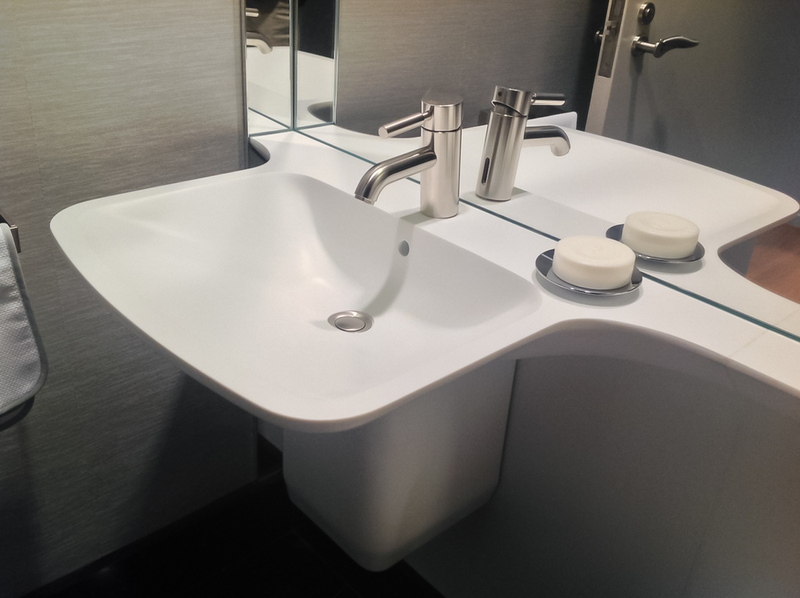 The Sterling Surfaces Manhattan sink project comprised of 80 custom thermoformed CORIAN® bathroom vanities to be installed in a luxury condominium complex in Manhattan, NYC. The design was conceived by the internationally acclaimed firm of Foster + Partners. Through collaboration with a highly qualified architectural millwork partner, the team worked through design & development challenges to finalize a mass-producible design that met the strict design criteria set forth by Foster + Partners, bringing the design to life. For example, the interior drain area went through several design configurations to achieve maximum drainage while preserving the appearance. Other design challenges included creation of the flowing CORIAN® underbelly, obscuring the plumbing while making it accesible, support, and design of the overflow. Any 3D CORIAN® thermoformed design is enabled by the vast experience of our creative team and its 15 years of experience with 3D forming. 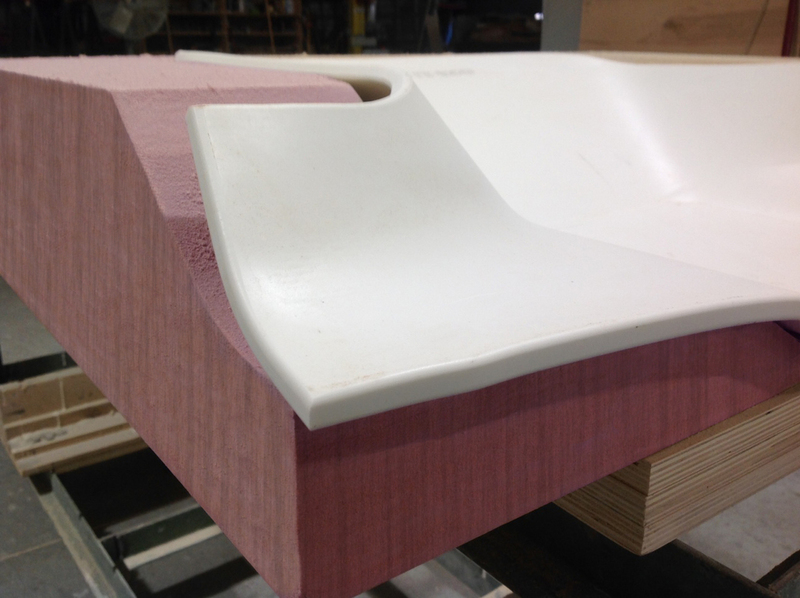 In addition, all Sterling Shapes benefit from extensive software simulation, material testing, and custom mold design to bring the heated CORIAN® material to life. A new Sterling Shape is born! Final step in the finishing department. This refreshing new Sterling Shape is a transitional design that softens the often harsh and unforgiving lines of contemporary styling, bridging the gap from traditional to contemporary. This flexible Sterling Shape allows for the variable use of the bowl, either as a stand alone wall hung unit, or as an under-mount bowl ready for seamed-integral-under-mounting under a CORIAN® deck. Many designers in search of innovation are experimenting with trough type sinks, which work very well with CORIAN® and other Solid Surface materials. However, these can be time consuming to make and must be executed correctly to create the right amount of internal pitch and drainage. 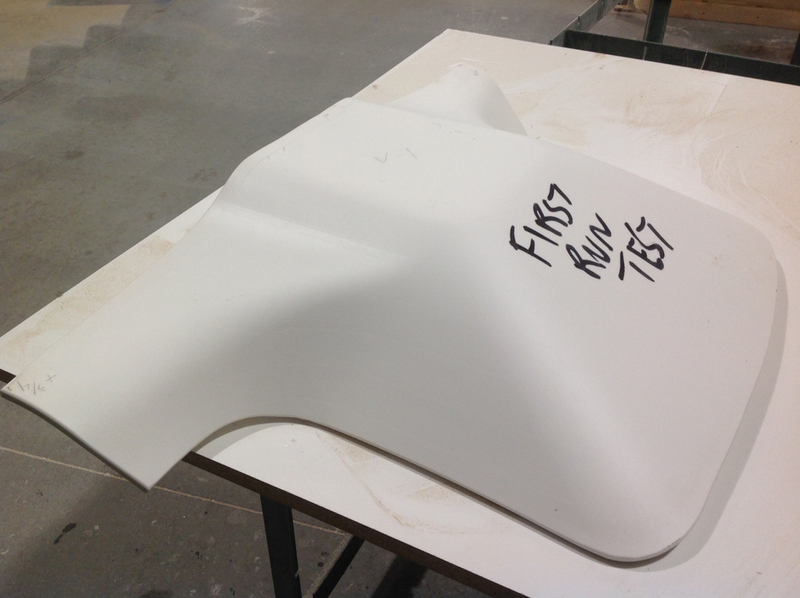 This product, being a one piece bowl, means that fabrication costs are minimized. The fact that this design is ADA compliant and available in many more Dupont Corian® colors than the typical 4 standard options add to the reasons why we love this new sink. This project excites everyone who sees it, even the Sterling Surfaces team, and we’ve seen a lot of shapes! Corian Bench - Choate Rosemary Hall. Design by Studio ABK. Fabrication by Sterling Surfaces. Photo by Jeff Baumgart. Architects and designers across the globe are falling in love with Solid Surface materials for their highly versatile characteristics. Because of this, we are seeing an increase of Solid Surface use in outdoor applications. While outdoor Solid Surface countertops are great, many architects go beyond the obvious. They have found interesting ways to incorporate Solid Surface materials in their outdoor designs in such ways as signage, furniture, wall cladding, play structures, lighting, sculptures and more. Several Solid Surface manufacturers even offer products specifically designed for exterior cladding and facades. For example, Dupont Corian® EC, as well as BUTECH from Krion®. "Corian® solid surface has low moisture absorption, and is resistant to environmental pollutants, humidity, and freeze-thaw conditions. These qualities make Corian® an excellent choice when designing outdoor applications." “All other options would have required lighting under the benches. They where concerned a metal bench would be too hot to sit on. Some people were concerned about the maintenance for wood overtime." 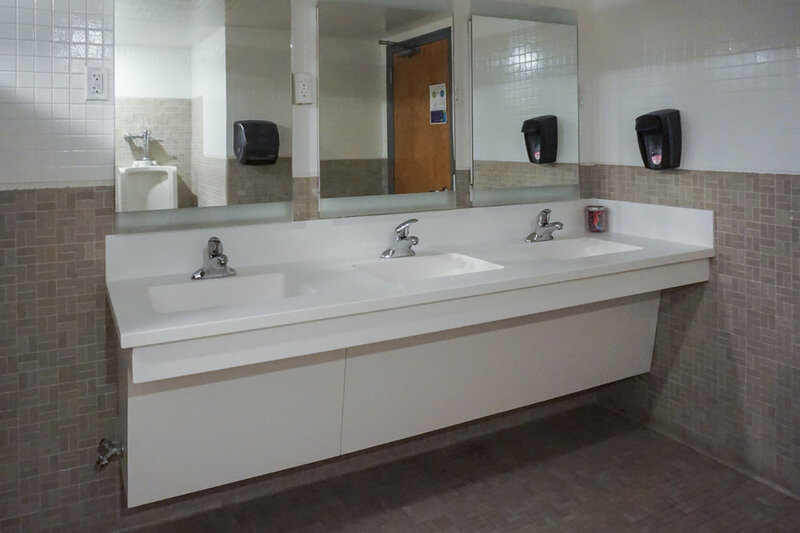 Even if something were to happen, for example vandalism or extreme abuse, Solid Surface materials are easily repaired and refinished. When you add to all of these great qualities the large color palate available, thermoformability and I inconspicuous seams, you begin to realize the endless possibilities Solid Surface materials have in outdoor spaces. Outdoor Table - Seaport Hotel, Boston. Fabrication by Sterling Surfaces. Photo by Jeff Baumgart. Swimming Pool. Fabrication by Sterling Surfaces. Photo by Kyle Caldwell.